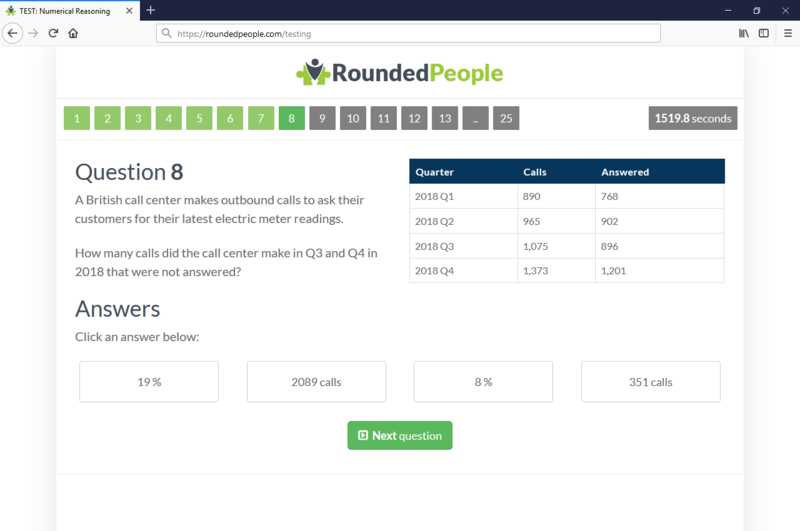 You have the flexibility of amending the time available and number of questions for any test type. 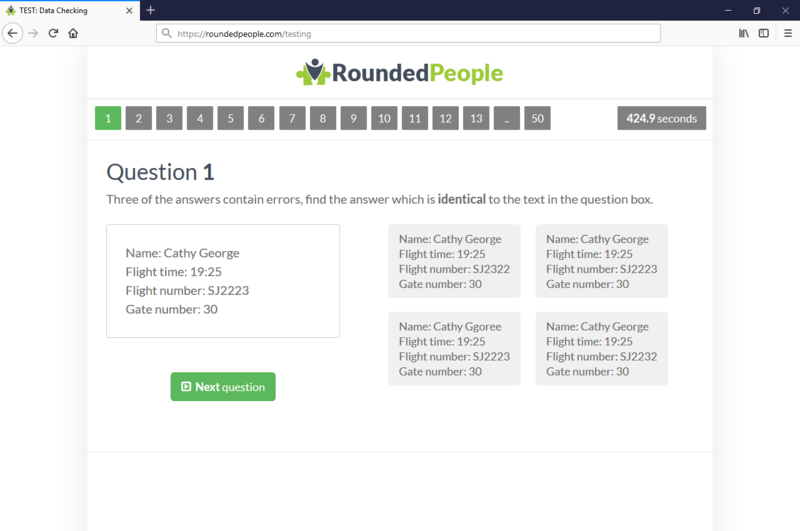 See below for the range of tests available on RoundedPeople for candidate testing. To keep things simple, every test costs the same, one test credit, regardless of the preferences you choose. Tests (by default) are not negatively marked. This means an incorrect answer provided by a candidate will score zero rather than decrease their overall mark. Designed to test every aspect of a candidates numerical ability. Candidates will be required to interpret pieces of information provided before performing a number of mathematical operations to determine the correct answer. Our numerical reasoning tests can be a great addition to your recruitment process. The tests include a wide variety of question topics & formats and come with all the usual features of our candidate testing service. 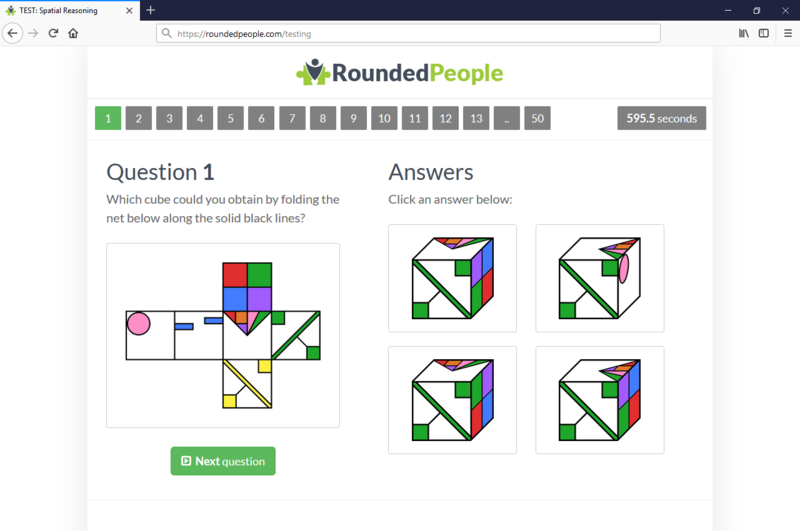 Also known as logical, diagrammatic, abstract or inductive reasoning tests, these exercises have been designed to test a candidates spatial awareness and ability to think logically. These are important skills in many professions and demonstrates a candidates ability to learn from previous experiences or identify missing information. The aim here is for the candidate to interpret a sequence or manipulate shapes to arrive at a related pattern/shape. Engineering positions commonly use this test. Data checking exercises require your candidates to analyse a collection of data (often letters and/or numbers) and select the corresponding identical data from a list of possible answers. These tests will assess the candidates attention to detail when data contains issues such transposition errors. The volume of data provided and time allowed per question may overwhelm weaker candidates. Strong candidates will approach each question in a logical way, answering each question accurately and with due care.